Sushi comes in a bewildering variety of forms all based on a simple idea. Sushi is flavored rice plus “something”. The something can be hundreds or thousands of different items, beautifully prepared and presented. At home, it is usually not practical to prepare so many things but try making a few items and serving them as appetizers. Cooked vinegared rice or sushi-meshi is what makes sushi sushi. Wash the rice well with cold water until the water is clear. Some short grain rice is polished with talc and this must be removed. 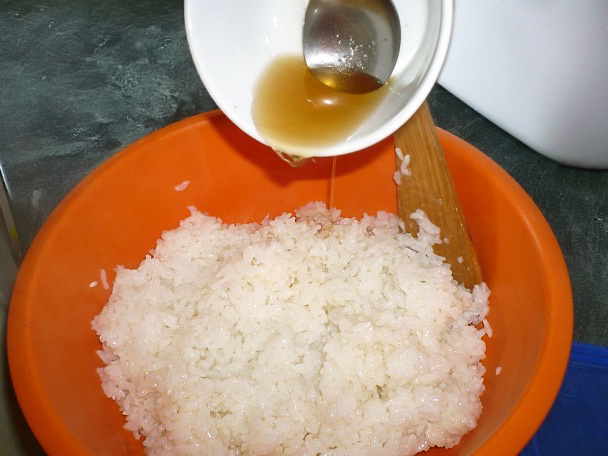 After the rice is washed, add 2 1/2 cups cold water and the Kombu and let the rice soak for 30 minutes. Combine the dressing ingredients in a saucepan and heat over medium heat until the sugar and salt are dissolved. Set aside to cool. After the rice has soaked 30 minutes, bring to a boil. Then reduce the heat to moderate and cover the pot, cook for 10 minutes. Reduce the heat to its lowest setting and cook an additional 5 minutes. Remove the cover, discard the Kombu. Pour the dressing over the rice and mix everything well. Allow the seasoned rice to cool down to room temperature for a few minutes before using in your favorite Sushi recipe. Alternately the rice should be folded and fanned to cool it to room temperature.